As old man winter creeps in, car owners start to think about taking precautions to protect their cars from the colder elements. Slush, snow salt and deicers wreak havoc, and it’s best to remove all traces before they can damage a cars delicate finish. Carwash owners should prepare for the onslaught of customers sure to roll in as the weather turns. Check out our tips on what you can do to make sure your carwash system doesn’t freeze you out. It’s important for car wash owners to invest in equipment that will allow your wash system to remove harmful agents on a car’s exterior and undercarriage. Choose products with added antifreeze for the cold weather. The right balance of cleaning chemicals can mean the best clean at the right cost. Make sure your weep systems are working properly. They are critical to preventing damage to your plumbing and wash system in the colder months. Take the time to ensure everything is functioning well and that it’s timed correctly. As it cools down, keep things toasty warm. Adjust your heat settings to ensure that they are set optimally for the current climate. Check your in-floor heating units and thermostat and timers. Confirm that valves are opening and closing properly. Check for leaks and make the necessary adjustments. 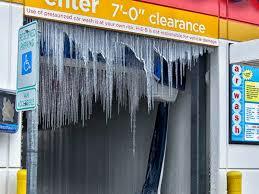 Keep the entrance to the car wash ice-free. Inspect doors and fittings for leaks, loose fittings and debris. Invest in a door system that can withstand a colder climate. Doors should open and close smoothly and at the right times. Ensure nozzles have been cleared of any debris, air and water pressure set to recommended levels and the conveyor chain running tightly. Finally, once maintenance has been completed, car wash owners should perform a test run and make adjustments as needed. Winterizing begins long before customers roll up to the door. Stay organized and consider implementing a maintenance program year-round, not just when winter sets in.